in June I wrote an article about decompressing ABAP source code, in which I talked about multiple efforts to decode the SAP DIAG protocol. Now I'd like to share my experience with the outcome of those projects. Have fun! The SAP GUI uses a proprietary protocol called DIAG for communication with the application server — which unsurprisingly does not support encryption, only (optional) encryption. To secure network communication, SNC (Secure Network Communications) comes into play: it adds encryption, single-sign-on capability and support for alternate authentication mechanisms. Anyway, the following assumes a default SAP setup, i.e. username/password authentication without any encryption mechanism in place. In the below tests, I'll login to client 000 with user DDIC, password ABCD1234 in English. The clients have the IP addresses 10.0.0.1 and 10.0.0.100, while the server has 10.1.0.20.
search the captured data for the (plain text) login data. wait for captures to appear. Cain is a very powerful tool and a perfect choice for security studies! The only thing that's missing is a parser for the dump, which directly extracts the credentials! You'll need: the JRE 6, SapCap itself, Jpcap, WinPcap and the MS Visual C++ runtime (unless already installed). I managed to get ot going on Windows XP (x32), but had to give up on my Windows 7 (x64) / JRE 7 workstation… but YMMV. SapCap works, but is a bit rough around the edges; besides the packet analysis didn't work for me. 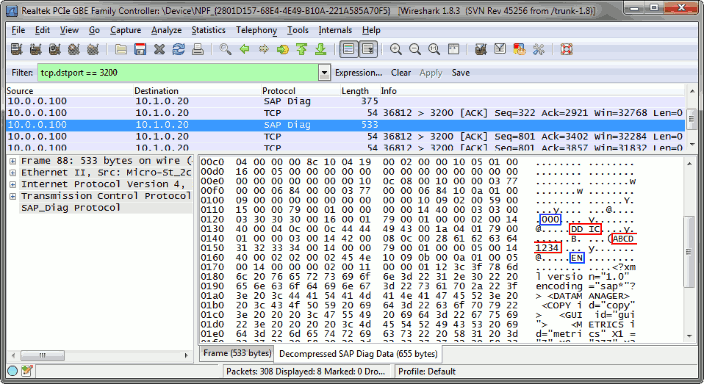 Wireshark is a powerful and polished network packet analyzer and probably the best open-source tool for this topic. The CoreLabs plugin has to be compiled along with Wireshark, but I didn't get it to work before I got bored (approx. 10 serious tries). Seems to be a proof-of-concept, nothing more! ➡ Update: Check this article for a review of the CoreLabs plugin! Apart from that, this plugin works really fine and since I'm a big fan of Wireshark, it's my first choice on Windows! Paper: "Sniffing SAP GUI passwords"